The Coma cluster is one of the largest observed structures in the Universe, containing over 10,000 galaxies and extending more than 1.37 billion light years in length. A long-exposure Hubble Space Telescope image shows a majestic face-on spiral galaxy located deep within the “Coma Cluster” of galaxies and islands of stars similar to the Milky Way. Nasa said the stunning long-exposure picture, titled “Island Universe”, shows the “majestic face-on spiral galaxy” in the northern constellation Coma Berenices amid a sea of stars.The galaxy, titled as NGC 4911, contains rich lanes of dust and gas near its center. These are silhouetted against glowing newborn star clusters and iridescent pink clouds of hydrogen, the existence of which indicates ongoing star formation. Hubble has also captured the outer spiral arms of NGC 4911, along with thousands of other galaxies of varying sizes. The high resolution of Hubble’s cameras, paired with considerably long exposures, made it possible to observe these faint details. 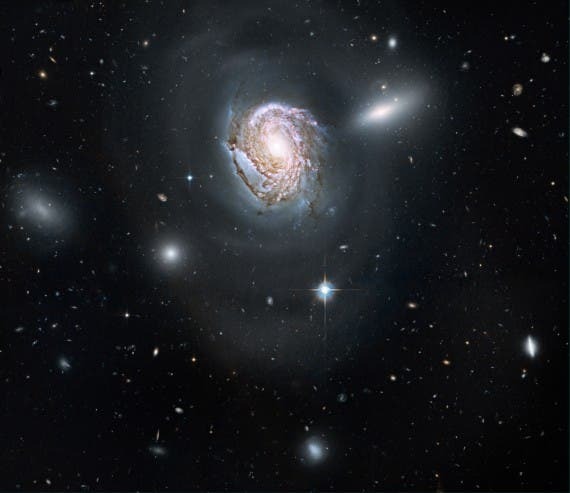 NGC 4911 and other spirals near the center of the cluster are being transformed by the gravitational tug of their neighbors. In the case of NGC 4911, wispy arcs of the galaxy’s outer spiral arms are being pulled and distorted by forces from a companion galaxy (NGC 4911A), to the upper right. The resultant stripped material will eventually be dispersed throughout the core of the Coma Cluster, where it will fuel the intergalactic populations of stars and star clusters. One light year is the equivalent of 5.9 trillion miles. It’s the latest in a series of spectacular images taken by the telescope and released by Nasa. In April Hubble celebrated its 20th anniversary with an image of a space constellation. More than half a million pictures have been amassed in its extensive archive from about 30,000 space celestial targets. The Hubble Space Telescope is a project of international cooperation between NASA and the European Space Agency. NASA’s Goddard Space Flight Center manages the telescope.